Those who visited the Greek Hovel last summer will remember the enormous pile of frigana built at the end of the garden. We all rather feared what wildlife diversity lived underneath it. It is no more. I arrived on Friday with the rain tipping down so there was no George. Vreki = no burning. But sod it, I thought I'd have a go myself. With a small dose of petrol from my frigana cutter and a broken seat from an old chair I got the blaze going. What is that recipe from The Gruffalo? Baked snake? No apparely Nigel Somerville says that it is scrambled snake. 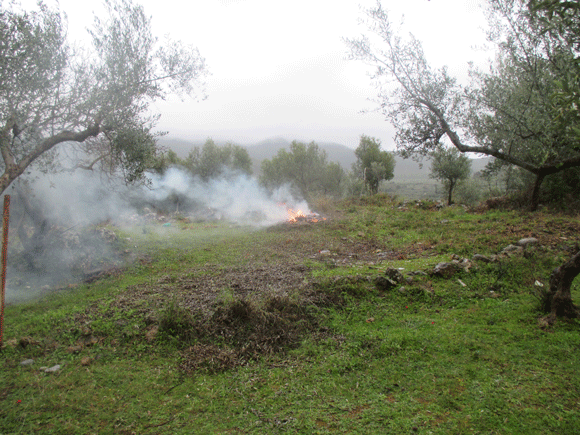 Anyhow the great pile is no more and I burned it myself while rain stopped play for the locals. A triumph Indeed.